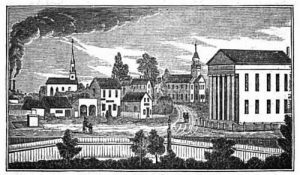 At its 1834 Town Meeting, pursuant to a constitutional amendment in 1833 requiring formal separation of church and state, the town voted to erect a new Town Hall. The First Parish Meetinghouse (and earlier meetinghouses) at the corner of Main and River Streets had served as the religious and political center of Sandwich almost since the founding of the village in 1639. The new Town Hall building was to be at the northern end of Lower Shawme Lake at the intersection of Main and Grove Streets on bog land donated by the Newcomb family at 8 Grove Street. Construction was preceded by extensive filling of the marshy land with gravel.